Given the timings of our previous visits to one of Brunswick's newer chic cafes, it would seem that Gingerlee + public holiday = our presence. On this occasion we'd met our out-of-town friends at the corner of Glenlyon and Lygon Rds, leaving open as many cafe options as possible (Poached, Sugardough, Small Block to name but some) to suit our brunch fancy of the morning. Savoury was where it was at for me, so the Persian-inspired dishes at Gingerlee got my vote. The notion of a tagine for breakfast seemed an excellent method of delimiting the morning meal; and while I would in reality be on the footpath of an inner-suburban street, maybe my choice would connect me with a parallel version of myself, on safari somewhere in northern Africa. And perhaps in elevating my choice of breakfast to such metaphysical levels, I inevitably set my expectations too high. 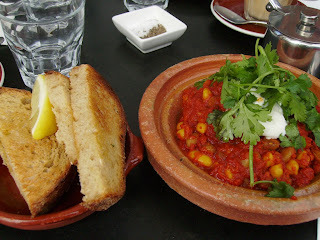 The tagine houses baked beans, a yoghurt lemon dressing and coriander, accompanied by a terracotta side-plate of sourdough. It didn't provide the exotic, spice-filled satisfaction I was after, unfortunately. The beans (chickpea and a yellow bean) were granular rather than soft. My disappointment with the texture could just be down to personal preference, although I would argue that a softer bean indicates that it's been cooked for a more appropriate amount of time. Had the beans and tomatoes had more oomph then the dollop of yoghurt would have been sufficient, but as the sharpest taste on the plate I would have preferred an extra scoop. I should have called in some more butter for the toast too: added to the bean consistency it meant the dish was a little dry. 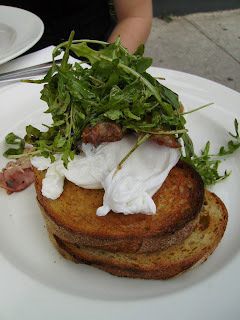 My next visit, however, will point me towards the poached eggs with rocket, ham, pork and fennel sausages and chutney. Runny eggs, sausages dotted with visible studs of flavour, and a chutney revealing chunks of garlic. If it's savoury you're after, that's a quality breakfast!